Cuban professionals arriving in Brazil at the beginning of the Mais Médicos program. 14ymedio, Havana, January 16, 2019 — Yury Leydi Durán Sánchez, a Cuban doctor who worked in the Mais Médicos program in Brazil and decided to remain in the country after Havana’s break with its agreement with Brasilia, has written an open letter to president Jair Bolsonaro to ask that he permit the return of her and her colleagues to the health system pending the validation exam. “I believe that we have sufficient training to fulfill the ’more health’ program, this time with a just remuneration and without chains or bonds of slavery, until the relevant exams are done,” she argues in the missive. The doctor, who says she speaks in the name of more than 2,000 doctors who decided not to return to Cuba, reminds that the Island’s professionals who have participated in Mais Médicos since 2013 have fulfilled the requirements that were asked of them upon joining. These, she reviews in the letter, were to be certified in comprehensive general medicine, have international experience in two countries, basic knowledge of two courses of Portuguese, complete the welcome program, and proven knowledge of Brazilian health protocols, in addition to participating in a specialization course with a thesis and final exam. Added to this, she highlights, they had to be residents of Cuba, something that excluded “deserters” (as Havana describes them) from previous missions. Durán Sánchez asks that, based on fulfillment of these requirements and the experience they accumulated serving in the remotest areas of the Amazon, they be permitted to continue working as before and refers to the norms of other countries that facilitate similar situations. One such situation is that of Chile and Peru, “which agree to the authorized doctors working for a year under supervision until the validation exam is carried out.” Another case is that of Spain, which allows doctors who are pending authorization in their specialties to work in primary care. The doctor appeals in her missive to the Brazilian people and to Bolsonaro himself, whom she personally flatters on several occasions. “Never before has a people, and much less a president, had the courage, like you and your people had, to defend our rights. And for that reason we are eternally grateful,” she maintains. The letter has been shared on the Facebook page of the Associação de Cubanos Livres no Brasil (Association of Free Cubans in Brazil), which has worked since October 2017 to demand the rights it considers violated by the Cuban Government. The doctors who did not return to the Island after the official call are sanctioned with the loss of their salary in national currency (CUP) that was accumulating in a bank account in Cuba and additionally with a penalty of eight years without being able to enter Cuba. 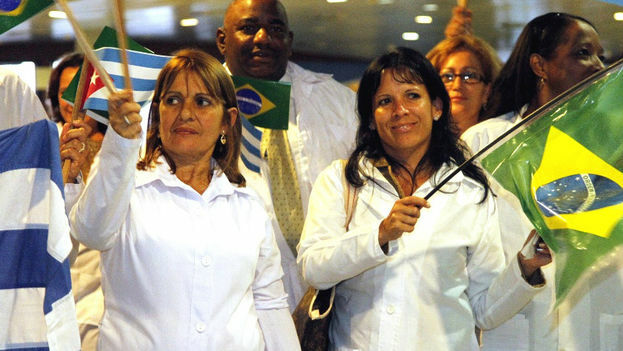 According to statements from Cuban president Miguel Díaz-Canel, 836 doctors did not return to Cuba out of the 8,471 professionals who were in Brazil participating in the Mais Médicos program.